I haven’t blogged in a while as last week was very emotionally charged for me personally – maybe it was for you as well. Between giving the weeks’ sermon, the events of the week, some wonderful family things and some obligations, I was running short on bandwidth. But here’s a bit of what I was going through my mind and likely will for a good while. 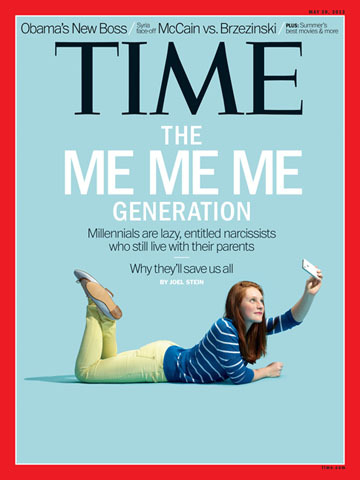 Time Magazine’s The Me, Me, Me” article on the Millennial Generation by Joel Stein. Unfortunately, you can’t read the article online for free (unless you are a subscriber or pay one of their content packages.) I identify myself as a Gen Xer (those born between 1968-1979) but I have a great deal of affinity and affection for the Millennials. The piece was well-written, the title and intro was a bit sensational (that’s how you try to sell magazines right?) but I did appreciate that he identifies his own narcism and his speculation of the Millennials actually being the ones to change the world and do the greatest amount of social good of any recent American generation has seen/done. Not exactly sure how that is measured though. Just like I’m not sure how narcism is really measured. I get that Stein cited this generation has the highest clinical cases of narcism but can he really compare the countless untreated people throughout the generations with the Millennials, especially since they are the largest, the youngest and fortunately, the ones whose Boomer parents have been able to send them to therapy/counseling? It made a huge difference that suspects Tamerlan Tsarnaev was killed and his brother, Dzhokhar Tsarnaev was apprehended by the end of the week. Clearly the fear went from hidden and lurking to a white-hot anger focused on making an example out of anyone who would attack innocent people. Still terrorism did its job. When I was visiting LA a few weeks ago I had the privilege of worshiping and visiting a few churches: Saddleback Church, RealityLA and Mariners Church (I intended on attending Mosaic as well but ran out of time). In the weeks since, I’ve been thinking the nature of large church environments, West Coast culture and the Northeast, what I liked and what’s thrown me off. 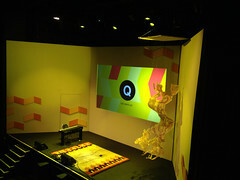 Q LA was a few weeks ago and every so often someone asks me about it. I was pretty excited heading into and loved my time there. I’m still processing but here’s a sarcastic and somewhat serious summary until I can post something legitimate. If you don’t know, Q is a gathering of Christian leaders (and some non-Christian) from different sectors of culture focusing on four themes Culture, Future, Faith and Gospel. The 7 that Q identified are: Media, Business, Arts & Entertainment, Education, Government, Social Sector and the Church. You can read more about Q here. 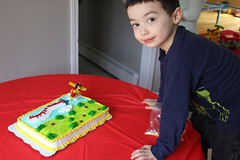 This past weekend we celebrated our oldest’s 5th birthday. It was a wonderful and a bit of an emotional weekend – the good kind though. My parents, my brother, my in-laws, dear friends, his friends from church and preschool were all around. Wow, hard to believe Nathan was born 5 years ago – feels so much longer and so much shorter. Time feels funny these days. Susan and I are so proud of our son – he’s sharp, he’s funny, we really do think he is intellectually gifted and we’re excited for him. If you don’t know our story, we are one of those couples who went through years of infertility, decided to adopt, then had two more biological kids, Dylan and Janelle, within a few years.